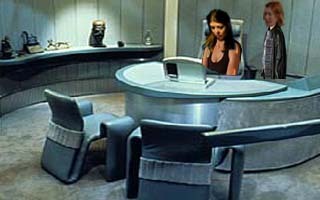 Jocasta sat slumped forward in her chair, her head propped in her hand, as she watched more useless data scroll across her screen. "Hey, Jo, take a look at this," Katherine called. Jocasta sat up straight and turned to her left where Katherine manned another terminal nearby. "What is it?" Jocasta asked as she stood and joined Katherine, looking over her shoulder at her computer screen. Katherine’s computer was tuned to Channel 21 News. The insert beside the anchorman read "Gruesome Murders Continue." The anchor had an appropriately grim expression as he sent viewers to Reporter Lisa Lance on the scene. The slick set of the news studio was quickly replaced by a grimy and litter-strewn alley, where the young female reporter stood, her pristine suit in stark contrast to the decrepit dumpster behind her. "It was here, behind this convenience store," Lance said, gesturing dramatically behind her, "that local police discovered the body of a thirty-two-year-old man, his chest savagely ripped open. This is the fourth grisly murder in almost as many days. Although Commissioner Hardin has not officially confirmed that the murders are related, she is warning residents to be on guard and to report any suspicious activity to the police. At least one source within the department believes this may be the work of a serial killer, but again, police officials aren’t confirming or denying anything at this time. This is Lisa Lance reporting for Channel 21 News." "Isn’t that the case you were telling me about?" Katherine asked, turning the volume down again as the news broadcast continued. "Sounds like," Jocasta replied. "I didn’t get a chance to follow up on the report that I saw earlier. I got sidetracked with all this other stuff." "Do you still think the murders are connected to Project 314?" "Savagely ripping sounds 314-y to me, or at the very least, worthy of a Gray Sector look-see." "Plus, I think it’s more than coincidence that the murders happened to start right after the evidence at Sunnydale mysteriously disappeared, when Tyrell and company just happened to rent a storage facility from Hubris Inc., who just happens to fly the same kind of transport that--"
Katherine held up her hands quickly to stave off the impending Jocasta-rant. "Okay, okay, you’ve convinced me!" she said, teasingly. She paused thoughtfully and then frowned in confusion. "If there are so many connections, then why hasn’t Gray Sector been called in? It seems like the police would have called the Council after the third murder." "You’re right," Jocasta agreed. "They should have. I’d better call the Commissioner or maybe the Mayor." Katherine’s eyes widened for a moment, and then she chuckled at her surprise as Jocasta began pulling up the phone numbers for the offices of the Mayor and the Commissioner. "What?" Jocasta asked a little absently, her fingers trailing across her comlink screen, eyes intent on locating the number. "Just you…debating about whether to call the Commissioner or the Mayor," Katherine said, blushing a little. "I guess I hadn’t really thought about how important you are." "Oh, I’m not that important really," Jocasta said self-deprecatingly. "I-I-I’m not even a Councilor, for goodness’ sake. I’m definitely nothing special." "No, you are," Katherine told her with a hint of awe in her voice. Then she smiled and added, "And not just to me." Jocasta grinned then shook her head with a slightly bemused expression. "You ever get that déjà vu feeling?" Katherine nodded and smiled even broader. "With you, all the time." The underground windowless room was mostly dark, lit only by a small lamp clipped to the edge of a workbench. Across from the workbench a wooden staircase ascended to the main floor of the building. Unseen, at the top of the stairs, the basement door creaked open and then creaked shut. Footsteps thumped slowly and awkwardly down the wooden stairs. Amidst the thumps came the soft whines of motorized movement. At the bottom of the steps, where the light barely reached, two feet made their final clomp to the concrete floor. A long black overcoat covered the legs. 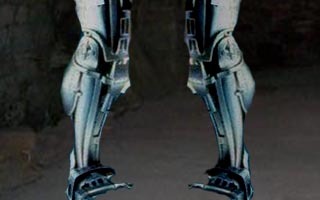 When it was pushed aside, two cybernetically-enhanced limbs were revealed. Each leg was encased in an exoskeleton of metal rods and hinges, all of which were intertwined in a tangle of plastic tubing and wiring. With another series of whines and thumps, the two legs moved deliberately towards the light. Once on the far side of the room, the feet stopped at the workbench. A cybernetic left hand lifted a small cooler and placed it on the workbench. A perfectly normal right hand caressed the top of the cooler. It lifted the top, breaking the seal of the cooler with a hiss. Inside, on top of a layer of bloody ice, lay a human heart.